Your wedding day is perhaps the most memorable, special day of your life. You want everything to be perfect. Imagine, if you will, a dimly lit dance floor with a soft cloud hovering at your feet (not required) as you and your mate share your first dance. As the music plays you close your eyes and melt into one another's arms. You are starting your new life together. Congratulations! 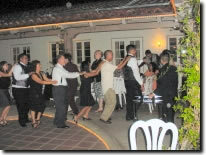 Not all DJ's are the same -- some do family parties, some do nightclubs, while we at Centerstage specialize in weddings. Not just average weddings or average DJ's, either. Wonderful memories are created when you match talent with experience. We create elegant, fun and unique wedding receptions regardless of your budget. We're not "Game Show Hosts" with cheesy personalities - we're professional entertainers. We work with you each step of the way to create just the setting you'd like. YOU select the music if you want because your day is about YOU! What sets us aside from other companies is our level of involvement with your event. We coordinate the entire reception from start to finish (unless you have hired a wedding coordinator.) We plan the itinerary with you and then provide the information to your photographer, videographer, catering manager, and any other event professional that needs to know the time schedule in advance. When your reception date arrives we arrive well in advance of your party and put your plan into action. This allows you and your families the opportunity to truly enjoy your day without worrying about the minute details. We're there for you. Plus, we never switch your DJ on you. The same person that you make time to plan the details with is the same person that will be at your event. We never contract your event to another company. All of this and a great time, too! Our prices are higher than you would expect. Why? Because according to our clients our work is far above average. If you're looking for just an average DJ, we understand. But if you truly want a unique and memorable experience, please give us a call today. Before making a decision or moving on, listen to what a recent client had to say. Talk is cheap! Words on a web page are just words. Windows Media or Real Media. Our ceremony system ensures that quality sound comes through our speakers. 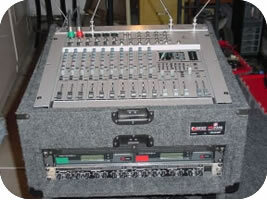 But part of our service also allows for your Videographer to take a "feed" directly from our professional 14-channel studio mixer. We provide Sennheiser lavaliere wireless microphones for the Minister and the Groom. Additional microphones are available for readers, singers, harpists, or other applications. Instrumental soundtracks are available for your singers. Full ceremony coordination can be included with this option. Prices vary based on your specific requirements and may include attending the rehearsal. Plus, we can record your ceremony as it happens and give it to you on a CD!